Suppleness comes in two components. The lateral flexion of the horse, its ability to follow the curve of a circle with appropriate neck bend, is the first component. The second component is longitudinal flexion which is the stretch across the top line, over its back and down the back of its hind legs. In this post we will talk about lateral flexion. I am not dismissing longitudinal flexion but I want to keep the post short. Suffice to say that a lack of longitudinal flexion will make lateral flexion difficult too. Lateral flexion will develop as a natural course of training your horse on turns and circles. It is important, as you will be aware from reading my book Master Dressage, that the horse must remain balanced through its shoulders as you make the turns and circles. If the horse is not equally balanced through its shoulders then you are not training flexion correctly, but instead leaning on one shoulder or the other. So this is your litmus test of whether the horse is ready to move onto smaller circles and turns, to improve the suppleness. Some riders flex the horse lots one way, then the other to improve neck bend. I do not do this as it is not a demonstration of suppleness, but of neck bend. Also I do not wish to force upon the horse such extreme levels of stretch when it isn’t ready; it feels to me to be a level of stress and forcefulness that I am uncomfortable using. This is very different than doing carrot stretches when off the horse, as the horse tends to use more of its shoulders and body to assist in the stretch. It works out how to stretch on its own, rather than the rider using the reins to pull the horse’s head around. If I find the horse is very stiff one way or another, and won’t bend easily, I tend to come back to walk and choose to do some deliberate falling in or falling out through the shoulder to teach the horse what I expect when I ask it to move the shoulder. For instance, let us say that the horse is falling in and it wasn’t listening to normal aids. At this point, I would exaggerate pushing the shoulder out, and bringing the nose a little too much in. After only a small amount of time doing this, the horse understands that I wish to position it’s shoulder. When I have had to do this, I have found that I would only need to do it for a few minutes in only one session, and I do not have to do it again. This has only ever happened on horses which have been trained badly, developed the habit of falling in/out or are extremely unbalanced naturally. It should not be a part of normal training, shoulder control should normally be established very early on in the horse’s training. In general the horse should always have a very slight bend to the inside, except when working on lines which are meant to be straight. e.g. the center line or across the diagonal. This will by itself help develop and establish the idea of bend and suppleness. It develops gradually, due to the natural progression through the training levels as one attempts more and more difficult turns and circles. 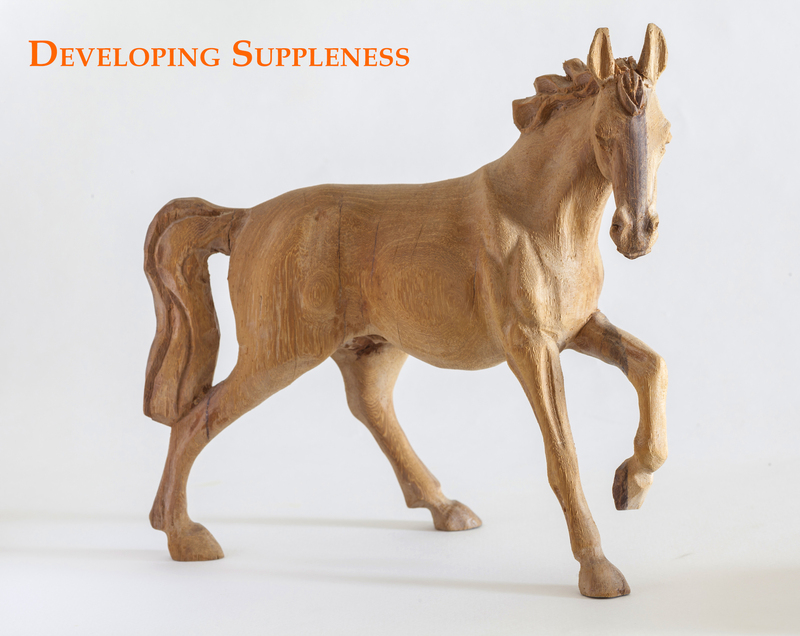 Suppleness is not neck bend with a horse falling out through it’s shoulder. Do not attempt smaller circles unless your horse is evenly balanced through it’s shoulders for the easier circle size. The feeling you should get as you make the circle the next size down, is that the horse finds it slightly more difficult, and that you will need to make a few little corrections, but it shouldn’t be a huge chore. Use carrot stretches, or other off-horse suppling exercises which are more natural for the horse and less stressful. Do not attempt to force excessive flexion of the neck. Be aware that even when going around the outside of the arena how your horse is bent. Always have a small inside bend. Whatever you do you are training the horse something and by allowing it to go large with an outside bend you are training the horse to lack suppleness on turns. Finally, when you read the test sheet and it says ‘Needs more suppleness’ have a think about how this comment came about. It could be that you are not preparing your horse correctly for the turn, or that you are being inaccurate in your movements and causing your horse to look like it needs more suppleness. It may be it is the rider making the job more difficult for the horse and not thinking about accuracy and fluidity in the test. Your horse does not track up and swing forward with the hindlegs.
? Dressage Training TV breaks down the skill of riding into bitesize chunks. We use rider biomechanics to explain the interaction between horse and rider. We use specific language which dismisses the mystique of dressage, and shows you how things work – logically and clearly. During training we do not limit ourselves to riding to solve our horsey problems. You also learn groundwork, horse massage, rider fitness and much more. Click the link to sign up below.